Razor-sharp claws and an incredible accelerated healing ability make Wolverine a nearly unstoppable threat. That is true. And it also sells this figure short. Which isn't a crack about Logan's height, it's... well, we'll get to that. This is, from the neck down, nearly the same Wolverine from X-Men Legends 2 - you know, the Juggernaut series. That one was wearing his brown costume, while this one is in his blue and yellow "clown suit" (as our own Poe Ghostal puts it). Instead of a wide red belt with a big brass buckle, he wears a wide red belt with a black X logo. He also gets the blue shoulder pads, done in a clever manner: rather than being glued in place on the torso, as we usually get, they're attached to the shoulder ball, meaning they move as the arm moves, looking accurate with any pose. The colors used are terrific. His yellow is a rich, solid color, not weak or washed out, and the black tiger stripes on his ribs and shoulders are applied crisply. The blue is a great dark shade, though the choice to make the shoulder pads metallic is odd. His eyes are blank, and he's gritting his teeth, which allows you to see that they even painted his lips a different shade than the rest of his skin. That helps reveal this toy's inspirations - the grimace, the huge flares on the mask... this is a Capcom Wolverine! No, it doesn't have painted pixels or anything, but considering that Hasbro's been doing some 4"-scale Capcom figures under the Gamerverse header, this feels like a branch of that, unintentional or not. I mean, it's not unintentional that someone sculpted a Capcom Wolverine - they knew exactly what they were doing - but it might be unintentional that Hasbro is selling one. Wolvie gets an extra pair of fists, despite having the removable claws we love so much. Maybe for people who get upset about the holes between his knuckles? There's really no other reason to bother with them. Drop the hands and give us an alternate unmasked head instead. He also comes with his share of this series' Build-A-Figure. 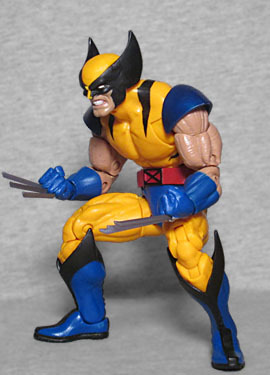 The BAF is Apocalypse, and Wolverine gets the most important, vital, and necessary part there is: the elbow-tubes. Hey, at least if you don't want or need a new Wolverine, your Apocalypse won't be missing anything important. Nicely done, Hasbro! This entry was posted in blog exclusive review, Hasbro, Marvel and tagged Capcom, Marvel Legends, Wolverine, X-Men. Bookmark the permalink. Multiple Man should've been the one to come with the tubes so you could army build him without being stuck with a pile of detached legs. Why are your X-Men week reviews just now showing up but the "what's new" section says they've been coming out all week?